The Vail Valley Partnership, the valley-wide chamber of commerce, on Tuesday announced an ambitious healthcare program for its membership called One Valley Healthcare Program. In response to challenges of the exploding cost of healthcare coverage in the Eagle County, Vail Valley Partnership partners with other industry associations to offer an affordable and accessible solution. 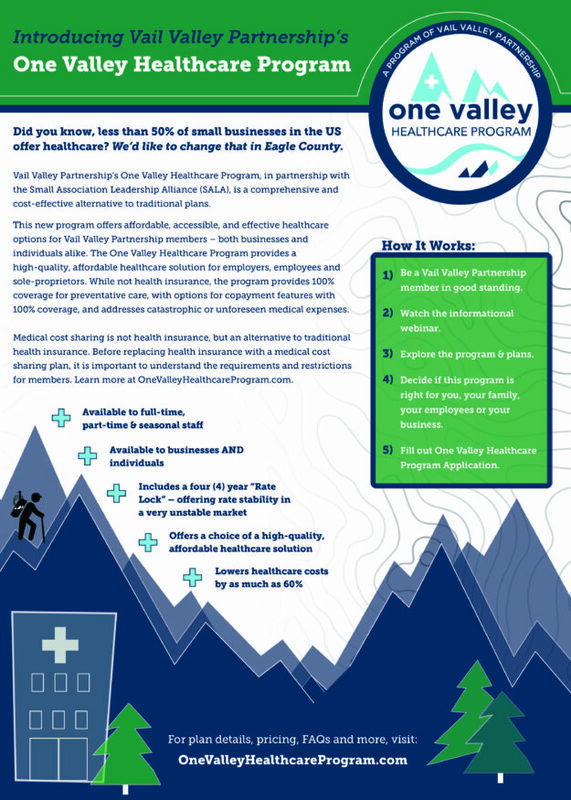 (Edwards, CO): Today the Vail Valley Partnership (VVP) announces a new program for its members aimed at providing employer members, their employees, and self-employed industry professionals a viable, cost effective, and accessible healthcare program. Entitled the One Valley Healthcare Program, this innovative new program couples two preventative care options with a medical cost sharing program to cover significant and catastrophic medical events. The program is made available to VVP members through the Partnership participating in the Small Association Leadership Alliance Healthcare Program. “Our team has been hard at work for over a year exploring various association healthcare programs. Three key criteria had to be met; 1) the program must be available and accessible in Colorado, 2) it must work for most of our members, and 3) have rates that provide meaningful reduction to the cost of healthcare burdening our community,” remarked Partnership President & CEO Chris Romer. With savings of up to 60% over traditional group insurance, the innovative One Valley Healthcare Program makes a significant impact on the bottom line of member businesses and individuals in Eagle County. The One Valley Healthcare Program simplifies what has become so complex and provides a high-end, affordable healthcare solution for employers, employees and sole-proprietors. While not health insurance, the program offers preventative care options, provides a four (4) Year “Rate Lock” ensuring rate stability in an increasingly unstable market, and can lower healthcare costs by as much as 60% when compared to traditional group health insurance. Available in time for the fall 2018 open enrollment period. Information about the Partnership’s One Valley Healthcare Program can be found at www.OneValleyHealthcareProgram.com and membership information can be found on the Partnerships web site at www.VailValleyPartnership.com.